Eskinder Nega, a journalist and blogger based in Addis Ababa, was sentenced on July 13, 2012, to 18 years in prison for violating anti-terrorism laws after he criticized the government for arresting journalists and anti-government activists. He was jailed for almost seven years at Kaliti Prison in Addis Ababa, where political prisoners are housed with criminals and family visits are extremely limited, before being released on February 14, 2018, as part of a larger amnesty of political prisoners. On the evening of March 25th, 2018, the Ethiopian Security Forces have re-arrested Eskinder and other journalists and politicians at a social event outside the capital, Addis Ababa. Eskinder was accused of displaying a prohibited national flag and gathering in violation of an official state of emergency but was later released without a charge on the evening of April 5th after spending 12 days of unwarranted, inhumane imprisonment. 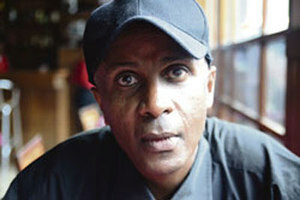 On May 1, 2012, PEN honored Eskinder with the PEN/Barbara Goldsmith Freedom to Write Award, recognizing his struggle in the face of adversity for the right to freedom of expression. On May 18, 2017, he received the International Press Institute (IPI)’s 69th World Press Freedom Hero award. Eskinder is one of Ethiopia’s leading advocates for press freedom and freedom of expression. He has been publishing articles critical of the government since 1993, when he opened his first newspaper, Ethiopia, which was soon shut down by authorities. He was a general manager of Serkalem Publishing House, which published the newspapers Asqual, Satenaw, and Menelik, all of which are now banned in Ethiopia. Eskinder has also been a columnist for the monthly magazine Change and for the U.S.-based news forum EthioMedia, which are also banned in Ethiopia. He continued to publicly call for an end to political corruption and repression despite being continuously harassed and denied a license to practice journalism. Eskinder had previously been detained at least six times over the past two decades under former Prime Minister Meles Zenawi. April 06, 2018: Eskinder was released from custody after spending 12 days of unwarranted imprisonment. Eskinder was among a number of journalists, politicians, and bloggers who had recently been pardoned by former Prime Minister Hailemariam Desalegn. Following Desalegn’s departure, a state of emergency was declared which includes provisions to limit the rights of free expression, prohibits criticism of the State of Emergency Proclamation itself, and prevents federal and regional media outlets from reporting on the state of emergency without prior authorization. Eskinder was detained in late March 2018 for allegedly displaying an outdated flag and fathering in violation of the state of emergency and has been released with no charge being filed. March 25, 2018: Eskinder is re-arrested at a social event outside of the capital, Addis Ababa. He stands accused of gathering in violation of Ethiopia’s current state of emergency regulations and displaying a prohibited Ethiopian flag that is popularly used among people who have opposed the ruling of the EPRDF coalition. Eskinder has not yet been charged. February 14, 2018: Eskinder Nega is released after serving almost seven years at Kaliti Prison in Addis Ababa. His release came 2 months after the Ethiopian Prime Minister Hailemariam vowed to release jailed political prisoners. Eskinder was one among 746 Ethiopian prisoners pardoned as part of a larger prisoner amnesty. Since his release, Eskinder has been meeting with supporters and participating in interviews. February 2018: On February 9, 2018, the prison officials attempted to force Eskinder to sign a false confession form that he was a member of Ginbot 7, an organization that the government deems a terrorist group, before his release under a presidential pardon by President Mulatu Teshome. Eskinder refused and asked to see a more senior official but his request was denied and he was returned to his cell. May 2, 2013: The Ethiopian Federal Supreme Court upholds Eskinder’s conviction and sentence. Eskinder has since appealed to the Court of Cassation. July 13, 2012: Eskinder is sentenced to 18 years in prison. June 27, 2012: Eskinder is found guilty of the charges filed against him. November 2011: On November 10, Eskinder is among 24 defendants charged under suspicion of terrorism. Later that month, government spokesman Shimeles Kemal states that Eskinder stands accused of receiving weapons and explosives from neighboring Eritrea in order to carry out terrorist attacks in Ethiopia. 2007: The couple is acquitted and released, but both are denied licenses to launch new newspapers. Their existing newspapers are shut down and not allowed to reopen. 2005: Eskinder and his wife Serkalem Fasil are jailed along with 12 other journalists for treason for reporting on the government’s violent crackdown following disputed parliamentary elections—a crackdown that includes firing on protesters and mass closures of media outlets. Serkalem gives birth to the couple’s son in prison in 2006. Ethiopia’s 2009 anti-terrorism law, which criminalizes any reporting deemed to “encourage” or “provide moral support” to groups and causes the government considers to be “terrorist,” has been widely criticized both for its vague terms and for its application, and has been used to imprison a number of leading journalists and bloggers.